We rarely bat an eye when reading headlines that talk of murder, corruption or worse. Our world actually makes sense this way—everything in its place, the same things happening over and over, revolutions of mundanity. We can accept these things, but our brain categorizes objects as “unusual” when we see odd proportions, sizes, lengths, and distances—anything that physically stands out. While the nature of what is visually acceptable or unacceptable is not static, it can end up feeling stagnate at times. 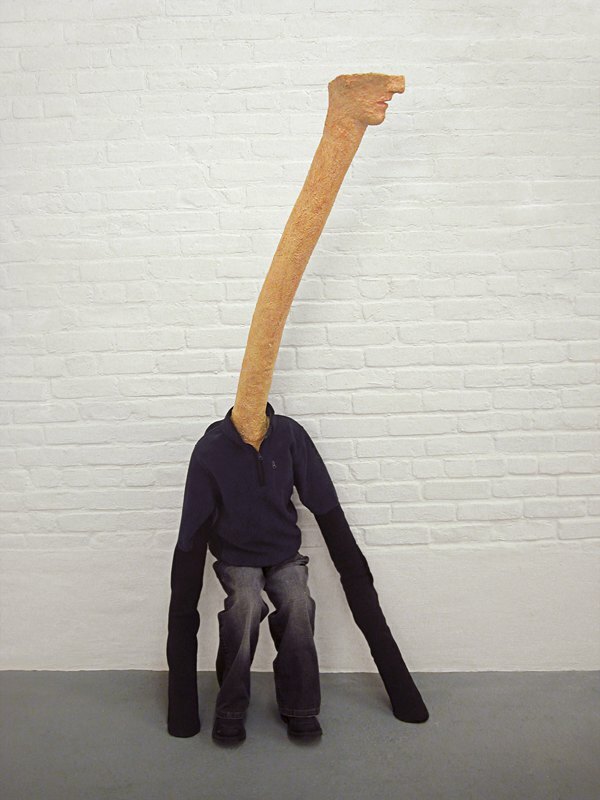 Clearly a little bored with the idea of traditional proportions, sculptural artist Hans van Meeuwen turns social convention on its head in his installation “The Civilized World” at Storefront Ten Eyck. A smattering of familiar objects fills a room in the gallery. Sculptures of a man, a book, a pool, a giraffe are all strewn about. But as our brain tries to identify the thread, it starts to feels as though we’re looking through the keyhole of a door into a surreal world. Something is off. Something is funny. The man’s foot is bigger than the rest of his body, jutting out of his leg and pooling onto the floor, like sand being poured from above. 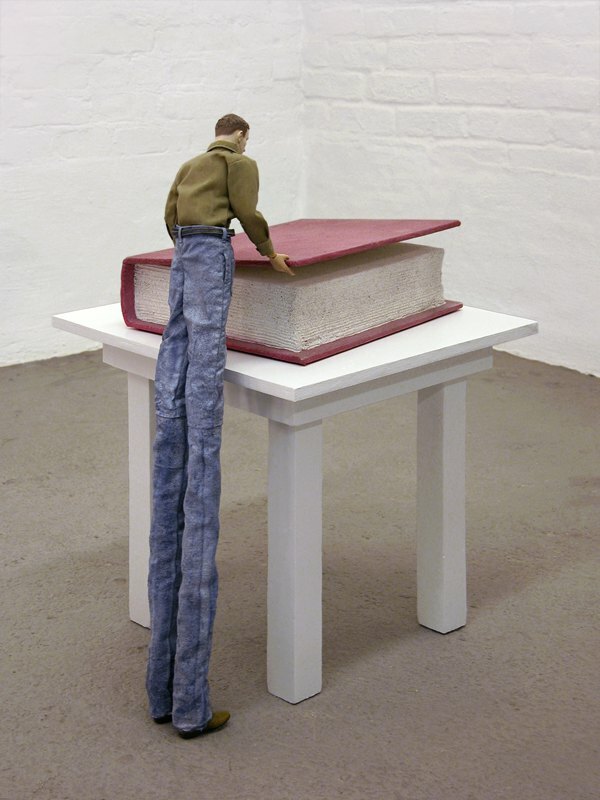 A small man stands next to a large book on a too-tall table. 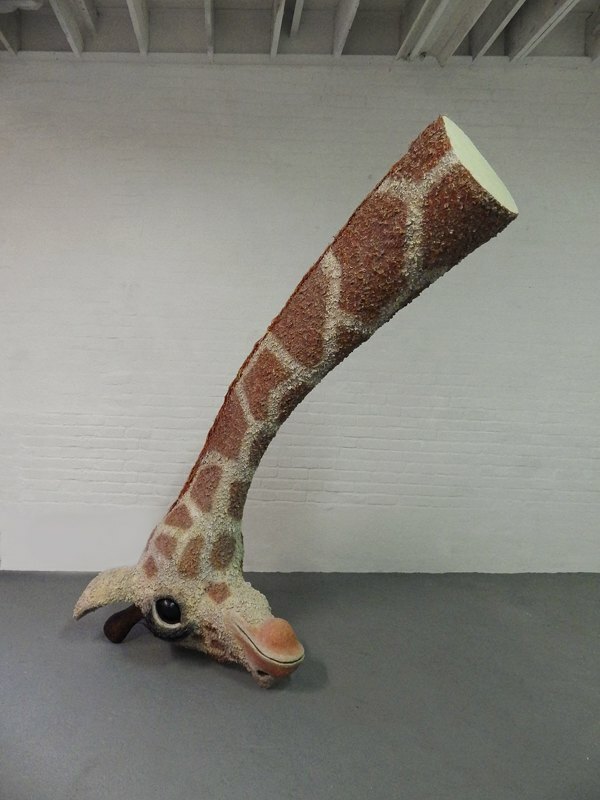 The giraffe’s head is disembodied and upside down. Another figure’s neck is abnormally long. A nose, pinocchio-esque, pokes out from a face on the ground. Each figure distorts the language of normal proportions, creating a new language of whimsy, wonder, and uneasiness. They ask the viewer for acceptance. Van Meeuwen is known for giving us new perspectives, redefining the regular with his drawings and sculpture work, combining odd elements of nature, architecture, humans and animals—and placing parts and pieces of them in unusual scenarios. In his 2003 sculpture “Potatoman,” a man is sitting on the ground, either with his head in an oversized potato—or perhaps his head is a potato. In a 2001 piece called “Les Vacances,” two large disembodied chicken feet stand before a tent. The nonsensical nature of his work often commands no explanation, like that of a child’s imagination. Before our minds were inhabited with reason, and the ability to decipher the average from the uncommon, we did not, as children, feel it necessary to provide an explanation for a man with a potato for a head. In “The Civilized World,” we see this motif again. The artist asks us to allow ourselves an acceptance of a nonsensical world—just as we once did, without judgment, no matter how silly or uncanny it may be. We reasonably explain away wars, fights and injustices. We live in a society in wherein, two years ago, a child with a gun in a school was horrific, and not normal. Now, 74 school shootings later, we have begun to accept that as a normal part of our world. Hans van Meeuwen’s work is a refreshing reminder that things do not have to be the way they seem simply because they have become common. We are, in fact, allowed to dream up other realities, and refuse to accept what’s common—visually and otherwise. Hans van Meeuwen's "The Civilized World" will be on view through this Sunday, June 29th at Storefront Ten Eyck.